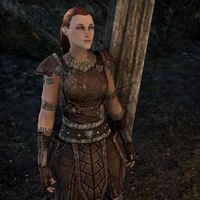 Svanhildr is a Nord who can be found inside of Malak's Maw. "Where in Shor's name did you come from? Never mind. Get me out of these ropes!" "I've tied myself up for fun. What does it look like? I've been captured by Orcs! Cut me free. I've got an idea for getting back at these pig-faced snowbacks." "Much better. That's one I owe you." "I'm angry at myself for getting caught by these milk-drinkers and I hate that. I owe them a debt. Want to help me thwart their little invasion of Morrowind?" The Orcs are carrying kindlepitch—I could smell it. Probably to burn Elven houses. Kill some of these snowbacks, collect their kindlepitch, and throw it at their torches in the supply shacks. It'll be fun." "I'm going to scout around and figure out our next move. Meet me at the huge gates after you've set the supply shacks on fire." "Ah, look at the dancing flames. Did you get them all?" It's done. The supplies are burning nicely. "Good. These Orcs will be sorry they took me captive. We Nords appreciate a nice, warm fire." "Those Covenant Banners are a source of pride to these louts. Destroying them would be a blow to their morale. I think you should burn them." "Then here's the finish. Kill their leader, Gruznak the Impatient. If there's one thing an Orc can't resist, it's a challenge. Blow the great horn by the gate—that'll bring him out. Meanwhile, I'll go find reinforcements." Look for a Dark Elf Scout by the mouth of the pass. I'll meet you there. "When you go for the banners, watch for the guards on the towers." What do you know about the Orc leader? "Skeever calls himself Gruznak the Impatient. I guess the Orcs consider recklessness a virtue. Can't say I think they're wrong. Just be careful. I hear Gruznak is one tough horker." "Ah, blood and fire. haha! Now, that's what I call a happy ending." It's done. Gruznak is dead. "Shor's stones, you did it! These troops heard the horn blow and came running from Narsis. With Gruznak gone, we can sweep up the rest of these Orcs in no time. You've got a heavy hand, friend. I like that." "Did you leave any for me? I wonder if I can get any of these Elves in the silly helmets to lend me an axe." This page was last modified on 9 February 2019, at 01:54.